Solidarity Activists Stand with Colombia | Fight Back! For two weeks in July, a solidarity delegation of the Colombia Action Network (CAN) traveled in Colombia, meeting with leading trade unionists, peasant leaders and other participants in that country’s powerful movement for justice and liberation. The CAN delegation was made up of anti-war and student activists from Illinois, Minnesota and Connecticut. The delegation investigated the impact of U.S. military aid through Plan Colombia and extended solidarity to the struggle of the Colombian people against U.S. imperialism. The U.S. has sent the Colombian government nearly $3 billion in military aid, which funds both the military and paramilitary war on trade unionists, human rights workers, student leaders and campesinos (peasants). This aid includes military advisors, weapons, helicopters and fumigation chemicals. 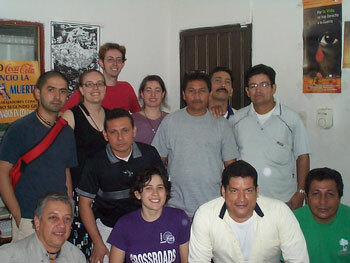 The CAN delegation met with representatives from the unions leading the labor movement in Colombia, including the CUT, Colombia's largest labor federation; USO, the oil workers’ union; the Bogotá teachers' union and SINALTRAINAL, the beverage workers’ union which has been fighting at Coca-Cola plants. Colombia is the most dangerous place in the world to be a trade unionist. On average, right-wing paramilitary death squads and the military murder three Colombian trade unionists per week. Many more are threatened every day. During the trip, two of the unions the delegation met with had members murdered that very day. Despite the danger, unions are fighting back and defending their right to organize. In May, the oil workers union, USO, completed one of the most important strikes in Colombia’s recent history. The government has been purposefully sabotaging the national oil company’s economic viability in an effort to justify selling it to foreign companies. Not only would this injure the Colombian state by taking away a valuable national income generator, it would leave all of Colombia's most valuable resources in the hands of foreign multinationals and kill the nation’s most militant union. This spring the Colombian government instituted layoffs which violated the union contract and targeted the union leadership. USO organized a strike for 36 days to fight against further layoffs, the privatization of the oil company and for the right to have a union. To end the strike, the government agreed to not privatize the company and to keep it 100% Colombian. This is an important victory for the Colombian people. Leaders of USO told the CAN delegation that the union was determined to resist any further attacks by the Colombian government. Another union fighting for the right to organize is SINALTRAINAL, the beverage workers union. Since 2002, the Colombia Action Network has been organizing in solidarity with this union. Last summer the CAN joined the international campaign for a boycott of all Coca-Cola products for their union-busting tactics, including Coca-Cola’s support of right-wing paramilitary death squads. Vice-president William Mendoza informed the delegation that the movement in the U.S. has helped. He said, "We’ve felt international solidarity and the pressure has decreased the threats to us. The company has had to give some means of security to us because of the international pressure. It’s because of this that we can continue our struggle." Matt Muchowski, a student activist from DePaul University who is organizing the effort to kick Coke off his campus, explained, "The paramilitaries are open in their support of the multi-national corporations and there’s been even a magazine article which described a meeting between the paramilitaries and Coca-Cola. I take this to be further proof that corporations such as Coca-Cola work against democracy and human rights. I will take this information and the contacts I’ve made here with SINALTRAINAL back to Chicago to continue to fight for workplace and student democracy." While traveling in the northern Colombian states of Antioquia and Arauca, members of the delegation talked with campesinos about how the fumigation chemicals that are purchased with U.S. military aid kill legal crops in along with coca. Campesinos said three years after the land has been fumigated they could probably grow coca, but that they had no idea if the land could ever sustain a less hearty crop like corn again. They argued the policy is ridiculous because instead of decreasing coca growth it is increasing the need for their communities to rely on quick growing cash crops like coca. Campesinos also expressed concern about the long-term environmental effects of spraying these poisonous chemicals on their lands. The chemicals not only destroy crops and rainforest, they make the livestock sick and pollute the rivers. Campesinos in both areas have been fumigated almost every year since the start of Plan Colombia. In addition, each year before the area is fumigated, it is ravaged by the Colombian military, followed by the paramilitary. The military and paramilitary threaten, harass, torture and terrorize communities before wiping out their ability to grow food, in an effort to punish them for potentially siding with the two national liberation forces: the FARC (Revolutionary Armed Forces of Colombia) and the ELN (National Liberation Army). Thistle Parker-Hartog from the Anti-War Committee in Minneapolis, Minnesota explained, "It’s important for people in the U.S. to understand the conditions Colombian campesinos face every day. Most of these farmers have no connection to the armed struggle and are merely trying to work enough to support their families and create a stronger community. The U.S.-funded Colombian military and paramilitary bring terror and intimidation into their streets and into their very homes. I hope that North Americans will be moved by the poignant stories from our delegation to take political action to stop the Plan Colombia policies which are impacting these campesinos."